TSONS offers three different “camp-like” programs during the year providing the option for year-round activity and engagement for our families and our students. The nine-week Summer Daze Program is open for students of all ages within the nursery school as well as the Parent & Me and Transition Classes. During our Winter Break and Spring Break nursery school aged children can attend our Wacky Winter Camp and our Spring Wing Ding Camp. It is our goal to provide young children with exciting and age appropriate summer fun in a familiar, comfortable, and safe setting. The warm summer days will be filled with songs, arts and crafts, games, guest visitors, non-pool water play, pre-sports activities, and special surprises! 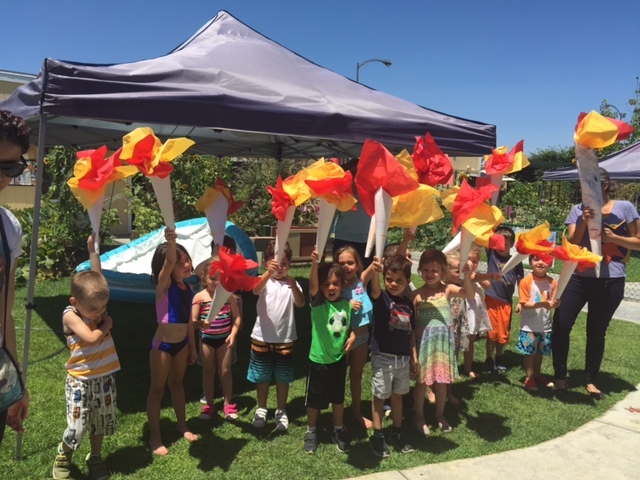 The fabulous shade awnings and water play will keep us cool and comfortable, and our own pool is available for activities during Enrichment classes and swim lessons. 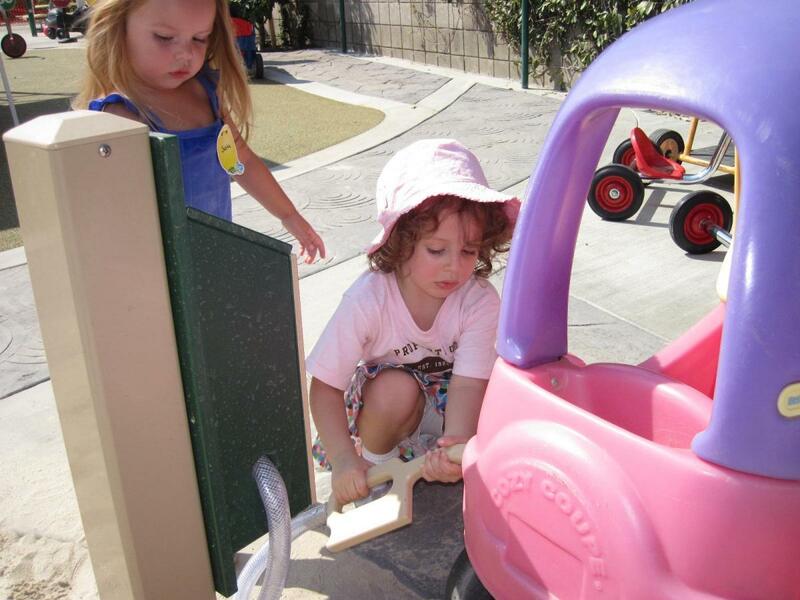 Nursery school aged children enjoy themed sessions that incorporate learning and play. Parents can sign their kids up to attend anywhere from two to five days each week from 9am to 1pm. There will also be Enrichment classes offered on Mondays, Tuesdays, Wednesdays, and Thursdays which can extend your child's day until 3 pm. TSONS Summer camp is a great option for Pre-K who want to reduce the number of transitions before moving on to Kindergarten. Also, Kindergarten students can come back for summer days filled with fun activities for these “older” kids! The Parent & Me and Transition aged children have a full nine-week program. Parent & Me classes are once a week, while the Transition classes are twice a week. The summer provides a wonderful opportunity for kids in Transition to get to know the children who will be in nursery school with them in the fall. Our Summer Daze program also offers Enrichment Classes from 1:00-3:00pm. 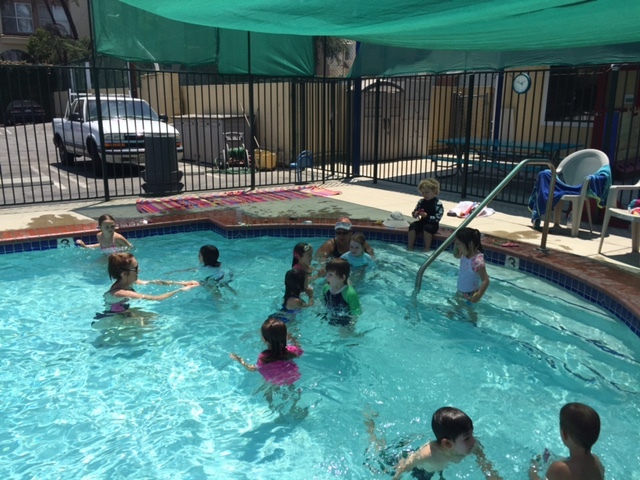 Mondays, Tuesdays, and Thursdays is a Swim Enrichment where children have the opportunity to play and swim in a group setting with Enrichment teachers, a swim instructor, and a life guard on duty. On Wednesdays there is an Enrichment class indoors featuring a themed activity. This past year it was a Summer Cooking class where children made all kinds of fun summer food. During our Winter Break, we are thrilled to be able to offer the nursery school aged children a full day from 9:00am to 1:00pm. This winter themed camp is full of winter fun. Children who attend are combined into one class, and all children bring their own lunch. Each day features a main activity, indoor play, center time, rugtime, snack, and of course outside yard time. Some of the highlights include making a snowman, making our own hot chocolate, and celebrating the New Year with our own TSONS version of a New Year’s Eve Party! TSONS also has a Spring Break during which we offer the nursery school aged children a full day from 9:00am to 1:00pm. This camp is similar to winter camp but with a spring theme. Children have the opportunity to plant something that they will then be able to take home. One of the treats of Spring Wing Ding Camp is harvesting what is ripe in the TSONS garden for a delicious snack.